Annette Kowalski is probably 70-something years old, but I don’t know for sure because she wouldn’t disclose the exact number. Kowalski’s official answer on how old she is is “very,” but she added that former business partner Bob Ross was around the same age and that I could deduce hers from that information. Ross died on July 4th, 1995 after a years-long battle with lymphoma. He would have been 73 in October. Kowalski, the owner and co-founder of the Bob Ross Company, met its namesake in 1982 after losing her 24-year-old son in a traffic accident. Kowalski was devastated by the event and her grief gave way to a deep depression. She coped as best as could by lying on the couch and watching her favorite television painter and personality, Bill Alexander. If you’re not familiar with Alexander, he’s best (or most succinctly) described as the original Bob Ross—except he’s German, and bald. Alexander hosted The Magic of Oil Painting and The Art of Bill Alexander on PBS. Though he's largely unknown today, videos from his shows still live on YouTube and his profound influence on Ross is apparent before you even press play. At a loss as to how to help his wife, Kowalski’s husband Walt got on the phone and called Alexander’s company in Oregon to inquire about making a cross-country trip from their home in Washington D.C. so Annette could take a class. 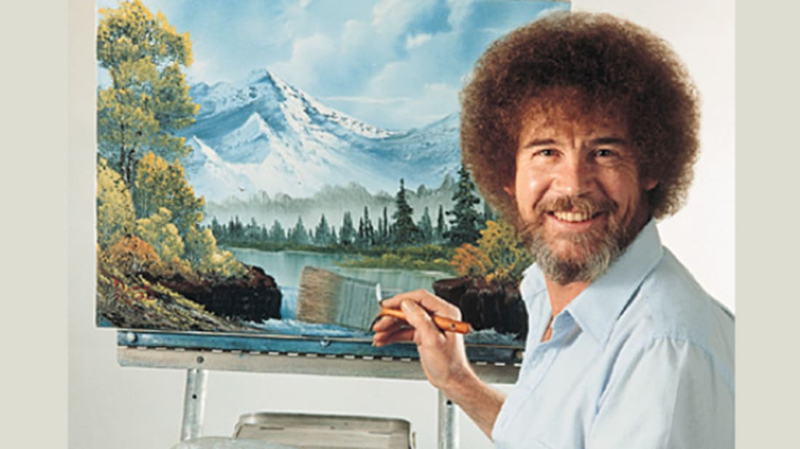 He was told that Bill Alexander was no longer teaching, but a young, unknown artist named Bob Ross was slated to take over. Ross had an upcoming class in Clearwater, Florida—so while he wasn’t the man she’d been hoping for, Kowalski and her husband got in the car and drove the 14 hours to Clearwater. Kowalski signed up for a five-day seminar, but it only took one for her to know that Ross was something special. Ross was a former military man who had served in the Air Force and was stationed for a time in Alaska, where he became well-acquainted with the kinds of landscapes he’d go on to paint on television. Ross eventually studied under Alexander after seeing him on TV and decided to try to carve a path as an artist and painting instructor before being tapped to continue the Alexander legacy. On the last day of that five-day class in Clearwater, Kowalski invited Ross to dine with her and Walt at a nearby hamburger joint. “I said to Bob, ‘It’s a shame I had to drive 1500 miles to take this class. Would you come to Washington D.C.?’” Kowalski recalled. Ross agreed, quoting Kowalski an “enormous” amount of money. She promptly booked a classroom at a local Holiday Inn and took out an advertisement in the newspaper. Only a couple of people showed up. They moved on to Baltimore and then other cities. Still no one came. Soon, the financial strain started to wear on Kowalski and her husband, who got fed up enough to propose the idea that would change everything. Walt suggested they recruit Bill Alexander to film a commercial in which he literally handed a paintbrush over to Bob, telling the world that Ross was now the bearer of the torch. Kowalski asked me this several times during our conversation, and she always was. Her only slip-up occurred when trying to recollect what happened next. She first told me they took the commercial right to PBS, but of course, PBS doesn’t air commercials. In fact they wanted the spot to run during The Phil Donahue Show, but it needed some work to get camera ready, so they took it to the local PBS station for help cutting the tape. When the manager at WNVC in Virginia saw it, he promptly recruited the young painter for a new television series. Ross dedicated the first episode of The Joy of Painting in 1983 to Alexander, and from there, he was up and running. More than 30 years later, Bob Ross has become a global phenomenon. Certified Ross Instructors (or CRIs) are stationed all over the world and The Bob Ross Art Workshop in New Smyrna Beach, Florida has around 100 of his paintings on display. His other works (there are more than 500) have been stored away, one of which—never before seen by the public—will be revealed and taught at the CRI reunion this October. I asked Kowalski if she could reveal any tantalizing details about the piece. “Oh, it’s just another landscape,” she said. For those interested, it takes three weeks to become a Certified Ross Instructor, which means you still have plenty of time before the reunion to become a member of the family. See Also: What Happened to Bob Ross's Paintings? The Bob Ross Company is headquartered in Chantilly, Virginia where Kowalski still works to keep Bob Ross’ happy clouds and trees out in the world, through television and in classrooms. She said she’s been surprised at how his fame has exploded in the Internet age, but added that it wasn’t just coincidence, crediting a lot of hardworking people behind the scenes. What hasn’t surprised her is that people continue to enjoy tuning in.